Hamas spokesman Sami Abu Zuhri said Tuesday that the group were not consulted by Egypt about ceasefire arrangements and only heard of the initiative through media outlets. “We fought in order to end oppression practiced against our people in general and the people of Gaza in particular, and ceasefire wasn’t our goal when we fought,” Abu Zuhri said. Islamic Jihad said the group was officially notified about the Egyptian initiative but will agree with Hamas on a joint response. Gaza spokesman Yousif al-Hasaynah said the group had reservations because it had not taken part in the wording of the ceasefire and will not agree to it without Hamas’ approval. US Secretary of State John Kerry has urged Hamas to accept Egypt’s ceasefire proposal to halt fighting with Israel in the Gaza Strip. “The Egyptian proposal for a ceasefire and negotiations provides an opportunity to end the violence and restore calm,” Kerry said. Arab foreign ministers in Cairo early Tuesday called on “all parties” to accept an Egyptian proposal to end the raging conflict between Israel and Hamas. 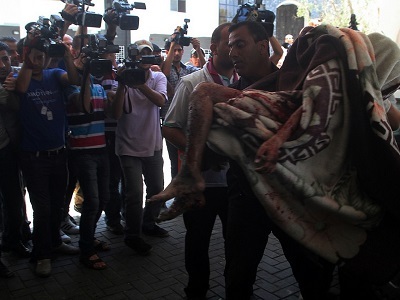 Over 190 Palestinians and been killed in Israel’s ongoing assault on Gaza, with at least 1,400 injured. No Israeli have been killed in the fighting.